Mixing colours can be really easy! With a few colours to play with and through some trial and error, you will soon learn the value of being able to mix your own colours. You will then be able to make any colour you require for that touch up or you may learn how to create new colours from left over ones for that decoupage project you have not gotten round to for lack of colour. It's all about getting your hands dirty and making a mess!! The best area for doing this task would be a table that cleans easy. Don't work on a table cloth unless it is plastic coated. Have a damp cloth with you for wiping up immediately if you spill. These are red, yellow and blue. By combining these three colours, all other colours can be made. 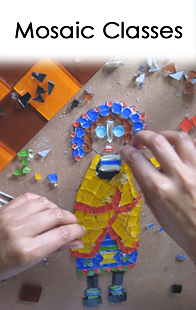 There are two main forms of primary colours, namely additive and subtractive colours, but we can concentrate on that at a later stage. Paint RED into one any of the triangles. Wash your brush out while waiting for the red paint to dry and dry the brush on a cloth. Count three empty triangles and paint YELLOW into the fourth one. Wash your brush while waiting for the yellow paint to dry. Dry the brush off by wiping it on your cloth. Count three empty triangles and paint BLUE into the fourth one. Wash your brush out while waiting for the blue paint to dry. Dry the brush off by wiping it on your cloth. By combining these three colours, all other colours can be made. 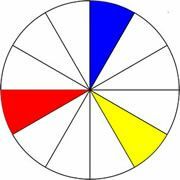 There are two main forms of primary colours, namely, additive and subtractive colours, but we can concentrate on this at a later stage. 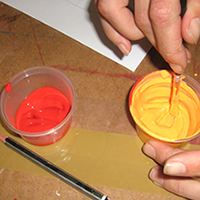 Take one yoghurt container and put one teaspoon of RED paint and one teaspoon of YELLOW paint into it. Mix the two colours together well and you will get ORANGE. 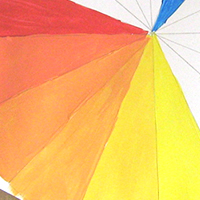 Paint the orange colour in the triangle in the middle of the red and yellow. Wash your brush out while waiting for the paint to dry. Keep the left over paint as we will be using it later. Take another yoghurt container and put one teaspoon of RED paint and one teaspoon of BLUE paint into it. Mix the two colours together well and you will get PURPLE. Paint the purple colour in the triangle in the middle of the red and blue. Wash your brush out while waiting for the paint to dry. Keep the left over paint as you will use it later. Take another yoghurt container and put one teaspoon of BLUE paint and one teaspoon of YELLOW paint into it. Mix the two colours together well and you will get GREEN. 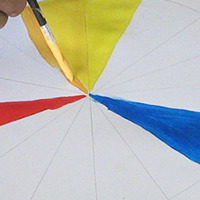 Paint the green colour in the triangle in the middle of the yellow and blue. Wash your brush out while waiting for the paint to dry. Keep the left over paint as you will be using it later. 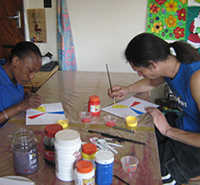 These are created by mixing primary colors in equal amounts. Yellow and red will make orange. Red and blue will make purple. Blue and yellow will make green. 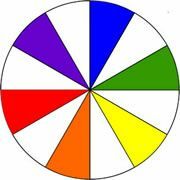 These secondary colours fall directly opposite the primary colours on the colour wheel and are complementary to each other. Take the remaining orange paint and divide it in half. Take a quarter teaspoon of YELLOW and add it to one lot of ORANGE paint in a yoghurt tub. Mix the two colours together well and you will get YELLOW ORANGE. Paint this colour in the triangle in the middle of the yellow and Orange. Wash your brush out while waiting for the paint to dry. Take the remaining ORANGE paint and add RED just as you did in the above step with the yellow. Mix the two colours together well and you will get ORANGE RED. Paint this colour in the triangle in the middle of the orange and red. Wash your brush out while waiting for the paint to dry. Take the remaining purple paint and divide it in half. 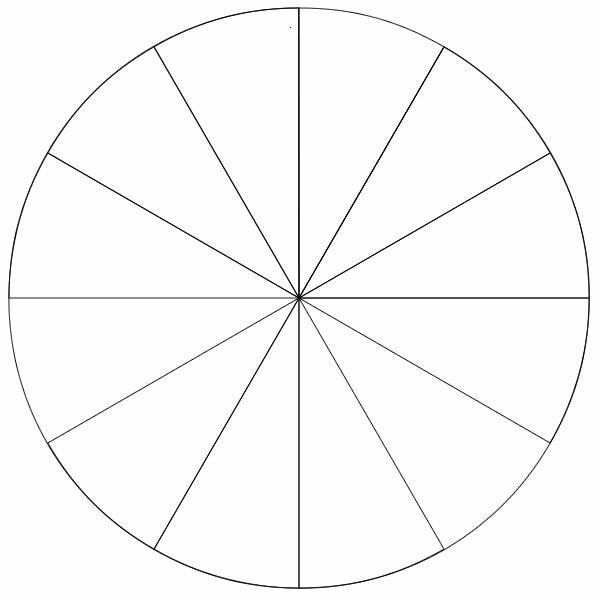 Paint this color in the triangle in the middle of the Purple and red. Wash your brush out while you waiting for the paint to dry. Take the remaining PURPLE paint and add BLUE. Mix the two colours together well and you will get PURPLE BLUE. Paint this colour in the triangle in the middle of the blue and purple. Wash your brush out while waiting for the paint to dry. Take the remaining green paint and divide it in half. Take a quarter teaspoon of YELLOW and add it to one lot of GREEN paint. Mix the two colours together well and you will get LIME GREEN. Paint this colour in the triangle in the middle of the yellow and green. Wash your brush out while waiting for the paint to dry. Mix the two colors together well and you will get BLUE GREEN. Paint this colour in the triangle in the middle of the blue and green. Wash your brush out while waiting for the paint to dry. 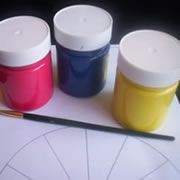 These are created by mixing a primary colour and the colour next to it on the wheel. Yellow and orange will make yellow-orange. 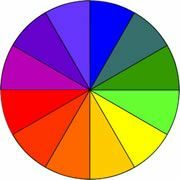 All other shades, tones and hues can be created from these twelve basic colours on the wheel. Congratulations, you now know the basics of colour mixing! You can save some money by only buying three, rather than twelve colours, from now on! Black and white are neutrals and are not really colours at all. Black is in fact a total absence of colour, in that all the light rays are absorbed and none are reflected. White, on the other hand, is a blend of all the colours in perfect harmony. White mixed with black will produce a series of greys. Tones are pure colors which have been mixed with varying proportions of both black and white to give greyed colors. Most people go about their daily life without even realising the effect that colour has on them. We are surrounded by colour constantly and it often powerfully influences our mood and emotions. Colours have very symbolic meanings for each of us and they can make us feel happy or sad, calm or irritable. You just need to look outside if you are stuck for colour combinations; any flower will inspire you and every tree with all its different shades is stunning to observe when in need of inspiration! !